Thanks to an extremely fun and sometimes crazy Skyshrine group, i managed to hit 95 on my Shadowknight. This makes my first ever max level character of any kind in EQ2. Despite my actual account being over four years old, i never managed to hit cap at any time. This was mostly due to other MMO’s i was involved in as well as never having the time to really sink my teeth into EQ2. I suppose i can sort of thank the free heroic character promotion from last month for getting me motivated to play again. In reality all it did was get me ten levels but that seemed to be enough to get me going and actually stick with it. The largest motivator has definitely been the doing away with of gear unlocking through the cash shop. That’s just something that i believe held a lot of players back that were not subscribers. Way to go SoE on that one for sure. How much am i actually enjoying the game thus far? Well, enough to go ahead and purchase the expansion. Tears of Veeshan will be launching in less than two weeks and i’m ready to go! Ready to pretty much replace all the gear I’ve acquired through running all these advanced solo instances. The raiders I’m sure have it much worse which is why I’m glad that i will not be getting involved in that yet or probably at all. 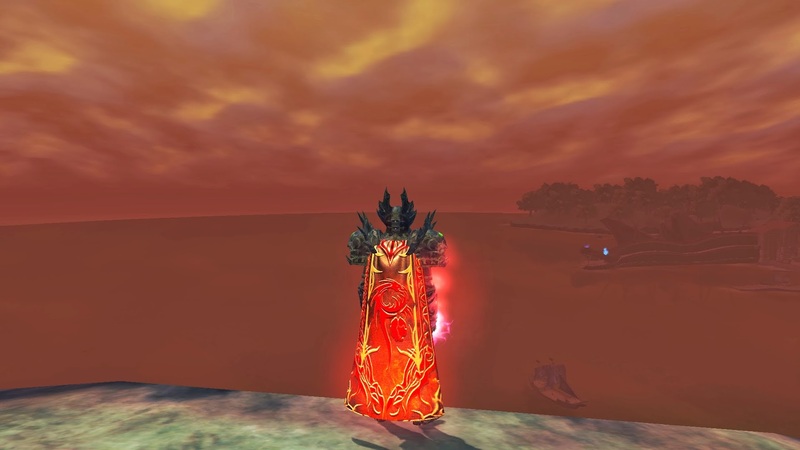 For pre-ordering the expansion, i got a pretty snazzy new cape. Bring on the new grind!